12 p. : ; 22 cm. U. S. DE1\ IT\ARTMENT (')t RIICET1 E.
;:!REAU OF 'E DTOIOl ',,,Y..C IRCUjLA X 1 ". 1 I 0. H A()W \RD., it,, l :' .,,I i u. Ao Hburwm,. Ai~ Ip ~ /*: J I . B UREA U OF ENTOMOLOGY. L. 0. HOWARD, I'ih,,i.,': and ( .,'of fBurcau. C. L. MARLATT, F,', .. ..,. andAct', .,, ,, fin Absemnc of I-i.;'f. IR. S. (CLIFT'ON, Exccntice Assistant. \V. F. TASTET, ( / ('(Chr. A. D. HOPKINS, inl (,, of forest insec isc in rsiti/gations. W. I). IHxNTEm in chirrc of sothcriin fidd crop insIct in ristigations. F. M. WVEBSTER, in i..." of cereal (nd forage insect iH t stiIt;IIions. A. L. QI'AINTANCE. in CIr'ta/c Of deciduous fruit insicl il vrstiyalions. E. l'. PIIII,LI'S. in charye of be ciltdire. I). M. RlOLERS, in f. prcrcnting spread of moths, Jnid work. ROLLA P. CiRRIE, iln ctlt/ ouf (diturial c iror:. MABEL COLCIORD, in charge of library. SOVlTHEIIRN FIELD CR()P INSECT INVEISTI(,ATIONs,. W. 1). IIHUNTER in chlarc. NV. D. P|I.I 1. ). n. nrciELL, E. S. TUCKEIR, T. E. ih Oi.LOW.Y, G. 1). SMn-T, E. A. A. C. MoI;AN, (I. .. RlUN'x. ni S. [. ('RI'MB, .'.... I i ttobIIco insect inlestial ions. T. c. l (iAKlI. C,. E. 1IoO'. enlqyd in suquor-cit' tiaw id ric iiivsct ilnrlsitigations. '. C. Plt rrT. .- ... .'. in cac( ts insect infcstiyg i. ions. ;I, / - .I ; II.%. L. 0. HOWARD, Entomologist and Chief of Bureau. lyv tlie publ)licat ion of Bullelin 7Il), referred to aLbove, ii xxwlicl I ll. St1 ii h itil[ II \. M ori.:in. 2 I)AMAGE TO SUGAR CANE BY THE SUGAR-CANE BORER. the sugar cane. T'lie tonnage yield per acre is reduced bv b}orer-. found to l)e reduced by borer infestation. INJURY To SEED CANE BY TIHE SUGAR-CANE BORER. , .,,, has ll eevn des| Coved. nulenr ot eyes in t he plat liad beenti dht roy-ed hv bloi'ers. The e:l'ect of illis is to ured Iuce tlte stand ol e.tile tlt allowingg i e ,a"
injury probably (loes not assline tinh economic impuorlance. IN.JtRY TM (MiIOWIN(i C'ANE IBY TilE SMRl'AK-ANE "HOI;I:I;. imets have Yet lbeen iadie to dietrniine the percent *o of ifjun. other case< I1ma111Y of tlhe stalks are broel+n r I)J lie mind, so, etil esiwc,. eco eti, Ino=e or less uplright, and in a"IV even I it will c nti iinti growthll. Tle ._',i' l. t injury prodt uced upol it is crooked ind ]enlit slalks. which are troublesome to harvel. DAMA. E 10 SI MIC R CANE BIY Tuim SIV\It C,\NI linlNl IM. 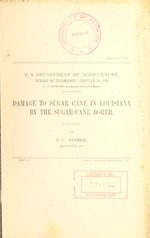 4 DAMAGE TO SUGAR (CANZE BY THE SUGAR-CANE BORER. losing a percentage of the sugar already(V stored up) in thle stalk. that to borer injury is directly due the great majority of broken stalks. most favorable to tlhi f especially in the older parls of the stalk. INJURY TO MATURE CANE BY TIlE SUGAR-CANE BORER. 2 [BIll. 7, llawaii Siwar Planters' Association ExIperiment Station, 1907.
it into the infested cohlm .ll .Tle ..:, l res lls are s1(mow[I ill Table 1"
borer free arid 2.521. or 6;. '75 per (ee-n(lt. xwere ijf(lel vby t(he ler. ------ - . . ..., .,..,..,..,.., . . . .. i i |! DAMAGE To srA.t CAE I; BY THE, SLUGA-CANt: UBIEll. 6 DAMAGE TO SUGAR CANE BY THE SUGAR-CANE BOBER. able near thle ground, altholigh the whole stalk is mire or less infested. (f cane, 100 stalks were picked out and ca(rehullv av erased in size. was imps11111))si le to select canes larger or smaller than the others. l hT j i i l w; . 'H+pJ j : *, *' / '. lio(use, aind was t h ire s<'l>nrut Ito int11 I wo lto intNo\(A andI ji i fn i n w 1. O f t lie 7:34 ca'ties, .:i13. o> r w 51.5I 1 )( er re!I .IvI were it11 ,'c t ", 'I'lThe Ijei-. can'es wei.ghl d (W11 lI inmls. an a\v(,rmy(, Of' 1.76< ]>irndn s jir cl'++ 1,. !F Mi" i' iO liti ,i ,N INi'S''AI' I')O" N t N CANE Jii K.
(0 ) 3,1 htm m joints. !Wre-freve canes. (2) H l3 otto in jinls, l)o rer-in(,.tet l canes. (3) 3. t(o) joints, lo -er) -ree canet . (4.) 31 to j()in P s, ho)re-infstd (oanes. DAM.UA E TP) S (;"Al; CANE BY THll,- S";.\);*A\N l;o10 W IM:. 8 DAMAGE TO SUGAR CANE BY THE SUGAR-CANE BORER. Samples 1 and 3 and samples 2 and 4 were thus from the same canes. was then analyzed, the latter operation 1,,iii- kindly performed by Air. W. G. T.-_j rt, chemist at the sugar experiment station. not sugar of 0.8 per cent. results of this experiment are given in tabular form in Table V.
1 3.1,ottom joints borer- Grams. Grams. Pl.ct. P. ct. P. t c. P. Ct. P. ct. P. c ct. P. Ct.
canes. Analysis made Nov. 10, 1910. DAMAGE T U SLGAl C ANE IBY TIlE S'UGAtI-('AN I' II BOIIH. /p4*?f nP tri to I/i f 'lIt i i f'unnn t'd. I f Iiw r m ". .. . 2, . .. i ; 7 17 I .. .. . ..
cenlt pulirity, a11d ali iincrl'ease o( sxlids llnt suI1aIr of t0.1 p''r cnl. Sample 3 (lwavilv infested) s e ()liwed l (1 of 2.3 pe.r cent juice. :;. ali i increase ()f 0.7 )pe'r ('cenit solilds noi t s i-.'. 10 DAM\(;I' TO( SI(;AI CANE BY TTIE SUGAR-('ANI E I',,!- . lo r 1;11,ira/ 0 10 (im,. Gmin Gins. P.ct. 1. c. 1'. ct. P. ct. P. I c 1 1. ct.
lblix II iLbs. l J Lbs. Lb' l P. ct.
infesled pile. Of the 731 canes, 39:3, or 53.541 per cent, were infested. oil the platform scales. Thie 3''; infested canes we\i._r .,q I p'iiids. il() juice 1 tc l ( <>1 <';1) (> n c' C (U l lCT l o l l l('+ .2 ) }x i T '!t. s i, cli lot of (cane w ts W it' T run 1t 5+m I i t'lj tthe indi l > [);ir l-,l :n. l a.
lhs -i juive< (d~i toi I lhe 1vorer'i \\vas I loius :.29'J. jwr runt . 12 DAMAGE TO SUGAR CANE BY THE SUGAR-CANE BORER. per cent in excess of the sucrose loss. loss of 1,078.50 pounds sucrose per acre. owing t(, the weakening of the stalk due to the tunnels and burrows. ilfal' urers are vitally interested in thlie work of the Sv,-';[r-cane borer. Investigations of methods of control in the held are now under way. are re',erred to thlie bullletin on tlie subject (Bulletin 70), by W. C.
Stubbs and 11. A. Morgan, of thlie Louisiana Experiment Station.